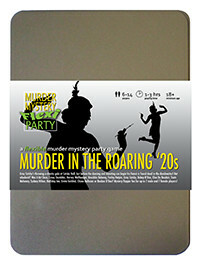 You've been invited to play the role of GRAY CATSBY in Murder in the Roaring '20s. Gray Catsby has invited his most talented and wealthy friends to a charity gala event at his countryside residence, Catsby Hall. But before any dancing and donations begin, Catsby’s fiancée, Ginger Whiskers, is found dead in the dumbwaiter! Join the flappers and dappers to find out who finished her off! With your black suede dinner jacket, white shirt and bowtie, you exude success and sophistication. A white handkerchief triangle peeks out of your breast pocket and you’re always holding a stylish cane or a champagne glass. Easy come, easy go - that’s your motto. And it’s served you well so far, having lost - and regained - your fortune several times already (thanks to your erratic poker skills). You have yet to work a day in your life, and prefer to pass the time drinking cocktails, flirting harmlessly with young ladies, and laughing loudly with your head thrown back while a champagne cork pops in the background. Well you all know me, Gray Catsby, and if you don’t, what are you doing in my house?! Tonight was supposed to be about music, and moonlight and love and romance - I didn’t kill her, no chance! Ginger Whiskers was my beloved fiancée. There’s a gingery whiskered shaped whole in my heart now. Still, there’s no reason you shouldn’t enjoy yourselves, unless you’re the killer of course. You may murder my guests, but you may never murder my evening!